Mesopotamia’s first-known empire, founded at the city of Akkad, prospered from the end of the 24th century b.c.e. to the beginning of the 22nd century b.c.e. Sargon of Akkad (2334–2279 b.c.e.) established his empire at Akkad; its exact location is unknown but perhaps near modern Baghdad. His standing army allowed him to campaign from eastern Turkey to western Iran. Although it is still unclear how far he maintained permanent control, it probably ranged from northern Syria to western Iran. His two sons succeeded him, Rimush (2278–70 b.c.e.) and Manishtushu (2269–55 b.c.e. ), who had military success of their own by suppressing rebellions and campaigning from northern Syria to western Iran. Yet it was Manishtushu’s son Naram-Sin (2254–18 b.c.e.) who took the empire to its pinnacle. He established and maintained control from eastern Turkey to western Iran. In contrast to his grandfather who was deified after his death, Naram-Sin claimed divinity while he was still alive. The rule of Naram-Sin’s son Shar-kali-sharri (2217–2193 b.c.e.) was mostly prosperous, but by the end of his reign the Akkadian Empire controlled only a small state in northern Babylonia. Upon Shar-kali- sharri’s death anarchy ensued until order was restored by Dudu (2189–2169 b.c.e.) and Shu-Durul (2168– 2154 b.c.e. ), but these were more rulers of a city-state than kings of a vast empire. The demise of the Akkadian Empire can be explained by internal revolts from local governors as well as external attacks from groups such as the Gutians, Elamites, Lullubi, Hurrians, and Amorites. The Akkadian Empire set the standard toward which Mesopotamian kings throughout the next two millennia strove. Because of this, much literature appeared concerning the Akkadian kings, especially Sargon and Naram - Sin. In the Sargon Legend, which draws upon his illegitimate birth, Sargon is placed in a reed basket in the Euphrates before he is drawn out by a man named Aqqi and raised as a gardener. From this humble beginning Sargon establishes himself as the king of the first Mesopotamian empire. The King of Battle is another tale of how Sargon traveled to Purushkhanda in central Turkey in order to save the merchants there from oppression. After defeating the king of the city, Nur-Daggal, the local ruler is allowed to continue to govern as long as he acknowledges Sargon as king. Naram-Sin, however, is often portrayed as incompetent and disrespectful of the gods. In The Curse of Akkad, Naram-Sin becomes frustrated because the gods will not allow him to rebuild a temple to the god Enlil, so he destroys it instead. Enlil then sends the Gutians to destroy the Akkadian Empire. As we know, however, the Akkadian Empire continued to have 25 prosperous years under Shar-kali-sharri after the death of Naram-Sin, and the Gutians were not the only reason for the downfall of the Akkadian Empire. In fact, there is no evidence for the Gutians causing problems for the Akkadians until late in the reign of Shar-kali-sharri. Although this story had an important didactic purpose, it shows that caution must be used in reconstructing the history of the Akkadian Empire from myths and legends. In the Cuthean Legend, Naram-Sin goes out to fight a group that has invaded the Akkadian Empire. Naram-Sin seeks an oracle about the outcome of the battle, but since it is negative, he ignores it and mocks the whole process of divination. As in The Curse of Akkad, Naram-Sin’s disrespect of the gods gets him in trouble as he is defeated three times by the invaders. He finally seeks another oracle and receives a positive answer. Naram-Sin has learned his lesson: “Without divination, I will not execute punishment.” Despite these tales, there are others that paint Naram-Sin in a more positive light as an effective king with superior military capabilities. until 1500 b.c.e. when it was replaced with dating by regnal years. There was also a standardized system of weights and measures. Taxes were collected from all regions of the empire in order to pay for this centralized administration. The Akkadian ruler appointed governors in the territories the empire controlled, but many times the local ruler was just reaffirmed in his capacity. The governor would have to pledge allegiance to the Akkadian emperor and pay tribute, but at times, when the empire was weak, the local rulers could revolt and assert their own sovereignty. This meant that the Akkadian rulers were constantly putting down rebellions. But perhaps the most important precedent started by the Akkadian Empire was the installation of Sargon’s daughter Enheduanna as the high priestess of the moon god Nanna at Ur. She composed two hymns dedicated to the goddess Inanna, making her the oldest known author in Mesopotamia. 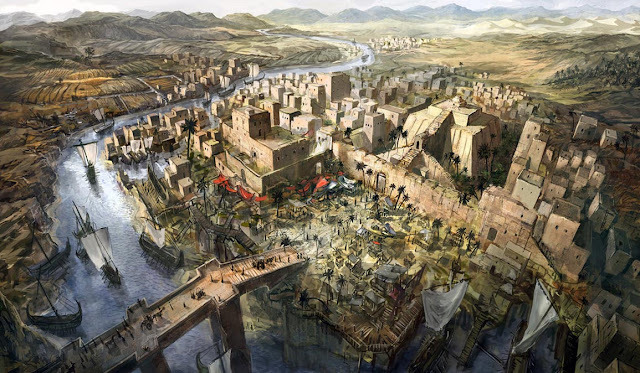 This provided much needed legitimacy for the kingdom in southern Babylonia and continued to be practiced by Mesopotamian kings until the sixth century b.c.e.